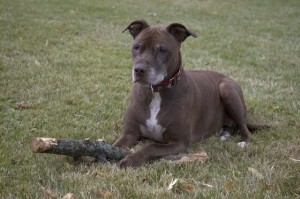 One of the many stories which emerged from BSL in Ontario, is the story of Hershey. At the approximate age of 6 years, Hershey found herself at Barlee’s Angels Rescue Network where it was love at first sight for Jennifer. Under the guidance of Jennifer, Hershey overcame her unfortunate beginnings, going on to be a certified therapy dog with the St. John’s Ambulance Therapy Dog Program in Ontario. However, Hershey’s stellar record as a therapy dog and Jennifer’s experience as a dog owner, were not enough to protect them from BSL. Read more about Hershey here.